and the National Arts Centre. Two Planks and a Passion. Lyrics by Vincent de Tourdonnet, Music by Rosalind Mills. Based on stories from women recently immigrated to Canada from Southeast Asia. 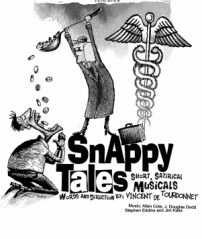 Also performed as part of Snappy Tales at Factory Theatre in Toronto and Talk is Free in Barrie. Recordings from the 1997 Dual-language production at Montreal's Place des Arts.